Featured will be work by Holly Andres, Blake Andrews, Amy Archer, Daniel Barron, Liz Haley, Mark Hooper, Tamara Lischka, and Grace Weston. Reception: Wednesday, November 1, 4–7 p.m. The Archer Gallery presents an overview of contemporary photography in the Northwest in a group exhibition featuring work by eight regional artists: Holly Andres, Blake Andrews, Amy Archer, Daniel Barron, Liz Haley, Mark Hooper, Tamara Lischka, and Grace Weston. Exploring the expanding conceptual and technical boundaries of the medium, while acknowledging the historical context of their work, each artist demonstrates their unique approach to the medium. Each of the eight artists exhibiting in Current Photography: New Directions has an extensive exhibition history in the region. 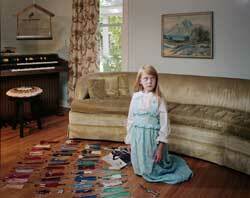 Holly Andres approaches her work in a multi-disciplinary manner–working in film, photograph, and installation. Recently exhibited in the 2006 Biennial at the Portland Art Museum, Andres will be showing work from her narrative photo series reflecting on history and identity. Grace Weston's photography combines humor, wit, and psychological tension in her staged vignettes of fabricated and found props and sets. Strong color and manipulated lighting enhance the theatrical narrative and fantasy of her work. Weston exhibits extensively in the region and was awarded an Individual Artist's Fellowship from the Oregon Arts Commission in 2006. Blake Andrews is a current participant in the Portland Grid Project. While attracted by the connection to reality inherent in photography, Andrew's transforms the external realities of his observations into black and white abstractions using slow shutter speeds on moving objects. Amy Archer is represented in Portland by the Augen Gallery and has shown her work on the East and West coasts. In this exhibition, Archer will be represented by a series of large works in which the artist multiplies a single image into a grid composition of repetitive complexity and beauty. Daniel Barron has had two recent presentations in the area at Pushdot Gallery, Portland, OR in March 2006; and Guestroom Galley, Grey Area, in June 2006. Barron's large scale work uses photo based abstraction to address the uncertainty and emotions raised by the technological advances and realities of our era. Liz Haley is a multi-disciplinary artist using photography, collage, sound, and video to explore issues of isolation and loneliness. Presenting new triptychs in the Archer exhibition, Haley's photographic work incorporates images encountered in 70's magazine ads and corporate web sites. Mark Hooper is represented in this exhibition with work from his recent series "Lewis and Clark: Quantifying Nature." Using the journey of Lewis and Clark as a metaphor to address the human need to understand and measure our surroundings, Hooper's photography was recently exhibited in the 2006 Biennial at the Portland Art Museum. Tamara Lischka's beautifully toned black and white photographs reference the natural still-life tradition of photography, yet her studies of marine life cradled in the human hand delve further into psychological query than her historical antecedents. Lischka most recently exhibited in the Whatcom Museum of History and Art exhibition, Contrasting Objectives: Fifteen Pacific Northwest Photographers, Bellingham, WA; and Pushdot Gallery, Portland, OR. Additional information about this show is available on the PortlandArt Web site. For further information please contact Marjorie Hirsch, Archer Gallery Director (360) 992-2701.